After a brief respite in our lovely room, we walked in the general direction of dinner. 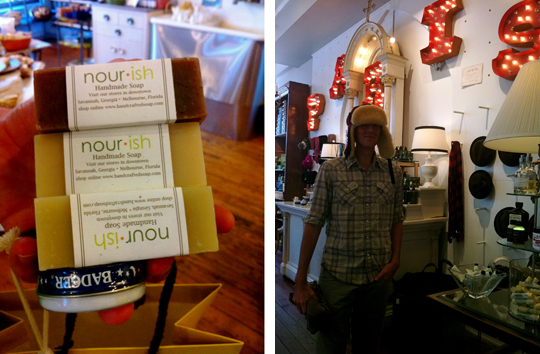 We stopped by some favorites from our previous trip to Savannah: shopSCAD, Nourish, and Paris Market and Brocante. Finally, we ended up on the edge of downtown, at Cha-Bella. Cha Bella has a commitment to local, sustainable ingredients, which is the quality that immediately drew us to the place. Each ingredient on the menu was chosen specifically with the season and region in mind; you can point to anything on your plate and your waiter will be able to tell you what farm it came from, or which section of the coast it was brought in from. Vance's plate was filled with a veritable kitchen sink of locally sourced ingredients — tilefish with a veal demi glace on top of savory sweet potatoes, topped off with an arugula-cilantro salad and lime vinaigrette. Oh, and there were homemade sausage meatballs floating in the lovely broth. I went with a more familiar plate of grouper with a corn succotash in a mild broth. It was delicious, but couldn't compare to vance's tilefish. Tile? Mmmm tile. 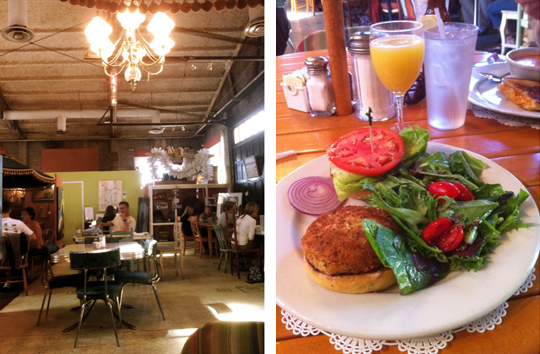 If you're headed to Savannah, I'd highly urge you to spend an evening at Cha Bella. 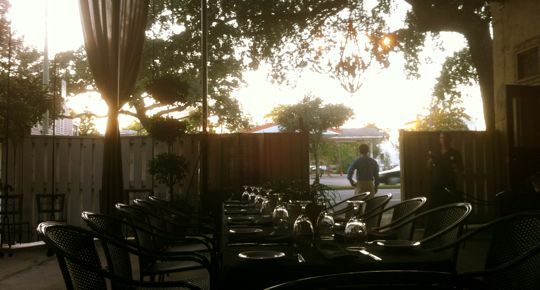 And if the weather's nice, treat yourself to a seat on their handsomely decorated patio. They've turned what looked like an old loading dock into a charming, comfortable eating and drinking space you could spend an entire evening in without recognizing the passage of time. If you're not ready to turn in after dinner and drinks at Cha Bella, you might follow our adventure to Circa 1875. The self-described 19th century atmosphere provided a welcome shelter from the halloween festivities that were starting up in bars all around downtown. That's not to say there weren't bartenders in costumes at this gastropub; I was served a gin and tonic by the beautiful Dolly Parton. If you're headed to Circa with someone special, try to find a seat in the "nook" — that is, if you want to hear what they're saying without having them shout HOW EXCELLENT THAT WHISKEY SOUR IS.